The Chris Kaman conspiracy: Are the Bucks in the game? No Andrew Bogut until April at the earliest, highly speculative and tenuous playoff hopes, a Bogut-less Bucks fan base that needs those playoff hopes, no space under the salary cap next season and most of the necessary roster ingredients for a trade. Stir it all together and you’ve got motive and opportunity for the Bucks to be party to a trade for veteran center Chris Kaman, who’s been publicly placed on the trading block by the New Orleans Hornets. The Hornets reportedly want “draft picks, cap space and a young player” for the 29-year-old former All-Star (2010) and his expiring $14 million contract. The Celtics have already declined. The Bucks have young players, draft picks and the expiring contracts of Ersan Ilyasova and Carlos Delfino, not enough to make the trade. (See Bucks salaries at Shamsports.com). But Stephen Jackson’s contract could get them there, if the Hornets are willing to take on Jack’s $10 million salary next season. Add Ilyasova, draft picks and/or the developing Darington Hobson, Larry Sanders et. al., and a trade could work. The Hornets could do a lot worse. Ilyasova’s become one of the better rebounding forwards in the league and would be a good addition to the Hornets undersized front court, led by Emeka Okafor. It’s no secret that, while Ersan is a key member of the Bucks core, Bucks management hasn’t been willing to trust him with starting PF minutes. For all the good Ersan does on the court, at the end of the day he’s still standing in the way of Jon Leuer‘s development. Acquiring Kaman helps solve the Bucks defensive rebounding problems (yes, it’s still a problem) in the short term, and clears minutes for Leuer. So while the Bucks are giving up the better rebounder (currently) and defender in Ilyasova, they would shore up the center position while clearing $14 million in cap space next season. And Jackson? The Hornets would be well under the cap next summer standing pat, and adding Jackson would still leave them Room. They’d only have to pay Jack a year (or less if they trade him). And, as the Bucks have discovered this season, Jack’s a good guy to have around in spite of all the angry yapping. So why don’t the Bucks keep him? Delfino and Mike Dunleavy, jr. play more or less the same position as Jack, and Luc Mbah a Moute needs small forward/guard minutes, too (locking down on Joe Johnson, Kobe Bryant, Paul Pierce, Lebron James, Danny Granger, Carmelo Anthony, to name a few). Jack’s fairly expendable, and the Bucks play just fine without him. 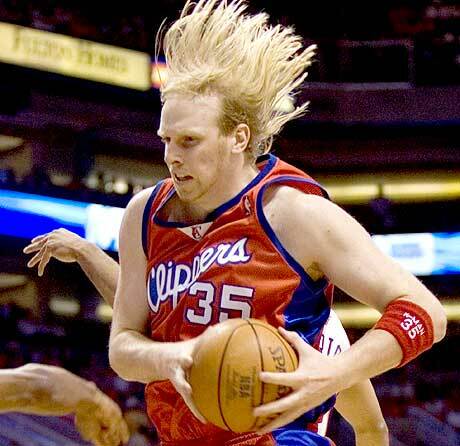 Kaman fits in well in the Bucks scheme, and he’s a more reliable offensive player than Bogut. Kaman helps get the Bucks to the post-season, where the Bucks would have Bogues, too (in theory) and a formidable white behemoth front court. So would the NBA-owned Hornets sting on this trade? With the league office involved, it’s not clear that the Bucks have the right expiring contracts for a trade, but there are a lot worse contracts out there than Jackson’s (Drew Gooden’s comes to mind). A trade would likely depend on the young players, whether the Hornets want to keep Ilyasova, and the value of the draft picks involved. It also depends on Bucks GM John Hammond, never one to stand pat or worry about stability or player development. 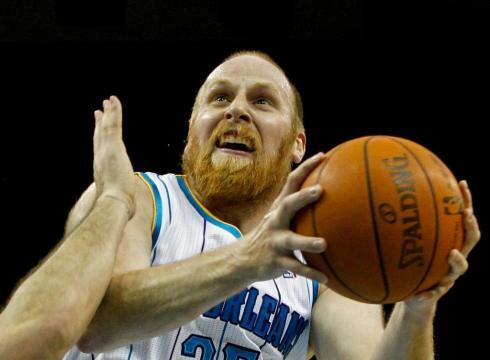 Of course, it’s also likely that I’m just talking myself into it so I can post crazy Chris Kaman photos. This entry was posted in From the Land of Ray and Reggie, The Jinx and tagged Andrew Bogut, Boston Celtics, Chris Kaman, Chris Kaman trade rumors, Darington Hobson, Ersan Ilyasova, John Hammond, Jon Leuer, Larry Sanders, New Orleans Hornets, Stephen Jackson on January 30, 2012 by J.D. Mo. Bucks coach Scott Skiles said after Friday’s blowout loss in Dallas that it was “impossible” to evaluate the 2012 Bucks. They’ve been too hurt, too MIA and too jumbled in disarray in this rush-start, lock-out shortened season; it just can’t be done, not yet after 11 games, not in Skiles’ mind. At The Bob Boozer Jinx, we’re undeterred by such obstacles, and have already noted that Skiles and Bucks GM John Hammond failed for the second year in a row to put a team on the court ready to start the season. With that in mind as the Bucks get set to play the Philadelphia 76ers on Martin Luther King Day, here’s your 2012 Milwaukee Bucks evaluation, coach, in order of most playing time to least. Brandon Jennings: He’s shooting better and has played smarter, attacking to the basket more than settling for that unreliable jumpshot of his, as the Bucks are playing at a faster pace than last season. BJ3 is among the NBA leaders in minutes played per game, was at one point near the top in free throws per game (he needs to do more of this) and was shooting 44.3% going into Philly, 35.7% from Downtown. Those are winning numbers for a point guard these days, especially one that keeps his turnover rate as low as Jennings does (10%). Had a tough game in Philly and couldn’t give the Bucks an edge in the 3rd quarter when they needed it, but make no mistake — Brandon Jennings has improved. Defense? That’s improved, too, as BJ3 leads the Bucks in steals. He wins the Bob Boozer Jinx “2012 Most Ready to Play” award. Stephen Jackson: He shoots, he scores. He shoots, he misses. A lot. A 42% career shooter who can’t make a third of his threes is not a good shooter, but that doesn’t deter Captain Jack. The intangibles? Showed up out-of-shape and with a sore back but looks close to 100% now, and he seems to be the kind of nasty competitor the Bucks need some nights — and there will be those. Unfortunately, he shoots so badly in some games — like today’s 3-for-12 against Philly — that the Bucks will often find themselves climbing out of a deficit as Jack rants. The Bucks can’t win with Jennings and Jackson shooting a combined 6-for-23. There will be those nights, and days, like these. Carlos Delfino: Here’s another guy who wasn’t ready to go, as he missed two games and was useless for three others due to a sprained shooting wrist. Del is the Bucks best 3-baller (38%), and a capable defender who is again leading the Bucks in steals. He’s solid all-around and would do well to take it to the hoop more often, and doesn’t help out on the glass as much as he could. When he’s on, the Bucks can be dangerous. Shaun Livingston: One of the reasons the Bucks can look at their schedule, look at their record, and feel like they should be 7-and-5 instead of 4-and-8 even after reading the injury report. Livingston has helped the Bucks build a few blowout leads, only to see them frittered away aided by offensive droughts, bad rebounding and Skiles’ flawed sense of matchups and rotations. A player who does everything there is to do on the basketball court well — turnaround jumpers from the post! — and has fit in seamlessly on the Bucks jumbled roster. He may have found his second NBA life in Milwaukee. Ersan Ilyasova: If you followed Ersan this summer with the Turkish national team and with Anadolu Efes in the Euroleague, you knew that Ersan had seemingly lost his jumpshot but wasn’t really bothering to look for it, content to play D, rebound and mix it up inside. He’s very much a player in transition from “Dirk-lite” scorer to cage-rattling NBA power forward. Does it look good in the box score or other metrics? Hell no, with the exception of the rebound column. Currently making Thaddeus Young‘s MLK day miserable in Philly, and is on the court with Bogut, Delfino, Jennings and Jackson – the Bucks strongest defensive unit today. That unit “got up on ’em and got physical,” said Bucks assistant Jim Boylan, noting that this was when the game changed. They pulled a 13-point deficit down to six in the 2nd quarter. Bucks trailed by four at the half. Important note: Skiles has managed to evaluate Ilyasova, deciding he’s an “off the bench forward” on “a really good, deep club,” and that this seems to be his NBA future. Ersan would beg to differ, and this will very likely be his last season playing for the Bucks (not a really good, deep club) and certainly his last playing for Skiles. Jon Leuer: Ilyasova’s heir apparent and fan fave, currently starting at power forward. Unlike Ilyasova, Leuer actively looks to shoot, and has been the Bucks most efficient scorer this season. The downside is that the Bucks defense and rebounding takes a hit when Leuer is on the court, evidenced by the first 4 minutes of the 2nd half in Philly, as the Bucks struggled to keep the Sixers off the glass. Enter Ilyasova at the 7:50 mark, as Skiles continues to play power forward roulette. The interior defense and rebounding picks up in the 3rd, but little else. The Bucks tried to pull back into the game in the 4th without Leuer or Ilyasova. Andrew Bogut: Not ready to play this season, missing four of the Bucks first eight games due to a “personal matter” back home in Australia. Staying on the court is AB’s main problem. Lesser problems: As more and more centers step out to the three-point line, pulling Bogut 20 feet or more from the hoop, Bogut will need to learn to adjust — and it is frustrating to watch Spencer Hawes draining threes. Bogut himself is stepping out a bit this season, encouraged to do so for the first time in his career, and he’s been able to knock down four or five set-jumpers. Bogut’s game remains close to the basket, of course, where he’s one of the best defenders in the NBA. He played strong against Hawes, racking up 20 points, 11 boards, four assists and three blocked shots to keep the Bucks within striking distance in the 4th quarter. His best game of the season, a hopeful sign for Bucks fans everywhere. Has Godot arrived? Drew Gooden: Bogut can’t play 40 minutes a game, certainly, and probably won’t play enough this season to qualify for the NBA leader boards, which makes the 30-year-old Gooden, the Big Zero, a primary NBA backup center for the first time in his NBA career. Check that – this project was attempted and abandoned in San Antonio and Dallas. It will have to work in Milwaukee, or Drew becomes a $6 million-a-year big man with no job. Poor guy. May end up spending most of his time playing high stakes poker with GM John Hammond. Larry Sanders: Drafted in the first round 2011, by 2012 he’s riding the bench behind Gooden, Leuer and Ilyasova – even Jon Brockman at times. A fantastic shot-blocker and defender in development, now a utility, garbage-time, odd man out. If Alton Lister was Nellie’s “Big Project,” Sanders is Skiles’ “Really Big Project” — one that the Bucks organization may not ever get around to. Mike Dunleavy, Jr.: Coming into this season, Dunleavy had missed 110 games from 2009-11, or nearly half of those three seasons. Now he’s missed eight more with a groin injury. Yet another guy who wasn’t ready to play this season. An injury-prone free agent acquisition by GM Hammond. Tobias Harris: Strong, good hands, gets to the rim and has good scoring ability around the basket, just as advertized when the Bucks drafted him. The Bucks rookie had made the most of his 90 minutes to date, and scored 12 against Philly in 21 minutes. The Bucks don’t have a small forward backup with Dunleavy and Luc Mbah a Moute out with injuries. The way this season has gone so far, the Bucks may consider taking a development year for Leuer, Harris and Sanders. Let’s hope it doesn’t come to that. Jon Brockman: The Brockness Monster is still that, and he’s a punishing rebounder. Problem is he can’t guard anybody and has no offensive game to speak of. GM Hammond knew this when he signed him in summer of 2010. It’s still not clear why he did it. Darington Hobson: Good floor skills and likes to drive. 6’7″ but plays like he’s 6’5″. Belongs in the D-League with the Mad Ants of Fort Wayne, Indy. Luc Mbah a Moute: Expect some player movement when Mbah a Moute returns to 100%. He’s signed and committed for four years ($19 million), and Luc will be here as long as Skiles is here. He was sorely missed against Philly. There are few things in the NBA better than watching Luc lock down on the likes of Andre Iguodala. …. And Skiles said this couldn’t be done. This entry was posted in The Jinx and tagged Andrew Bogut, Bob Boozer Jinx, Brandon Jennings, Carlos Delfino, Darington Hobson, Drew Gooden, John Hammond, Jon Leuer, Larry Sanders, Luc Mbah a Moute, Mike Dunleavy Jr., Milwaukee Bucks, Mission Impossible, Philadelphia 76ers, Scott Skiles, Scott Skiles' Amazing Forehead, Spencer Hawes, Stephen Jackson, Tobias Harris on January 16, 2012 by J.D. Mo. Before the Bucks headed West two weeks ago for a five game road trip, we looked at the league leader boards, some advanced stats and other basketball geek fodder, and found some good things to write about after a small sample. Two weeks later, there’s little good to write about, as nearly every Buck but an improved Brandon Jennings has either been injured or inconsistent or worse. The Bucks’ vaunted Top 5 defense has gone to pot and now rates 16th, allowing one point more than the league average of 102.6 points per 100 possessions. The Bucks, a team notoriously good at protecting the defensive glass, now ranks near the bottom with a 70.8% defensive rebounding rate. Bucks center Andrew Bogut has not played well or even rebounded up to his standards (15.5% rebound rate, AB?) and, well, now he’s not playing at all after suffering a concussion against the Pistons on Thursday. Carlos Delfino and Stephen Jackson have played well in spots. In some stretches, they’ve been horrendous. That was long ago, in another time and place and galaxy, in that long-ago age of Chicago Bulls basketball that didn’t include Derrick Rose. Or they’re just a mess that, for the second year in a row, was not ready to begin the season. Note: The Bucks have played the 22nd toughest, or 9th easiest schedule in the league. This was not the part of the schedule where they could afford to go 4-and-7. This entry was posted in The Jinx and tagged Andrew Bogut, Brandon Jennings, Carlos Delfino, Drew Gooden, Ersan Ilyasova, Jon Leuer, Larry Sanders, Scott Skiles, Stephen Jackson on January 15, 2012 by J.D. Mo. Bucks GM John Hammond’s $6 million man will get another chance to prove his worth in Sacramento tonight, as center Andrew Bogut has not yet returned to the team. Bogut left for “personal reasons” Tuesday in Utah. UPDATE: As of today (Thursday pregame), Bogut was still gone and the Kings have fired coach Paul Westphal. So it’s up to the much-maligned Drew Gooden, “the Big Zero,” the man who has seemed in a world of his own as a Buck, to establish a paint presence against Chucky Hayes and the Kings young frontcourt of J.J. Hickson, Jason Thompson and, yep – he’s back from another temper tantrum and fight with the now departed Westphal – DeMarcus Cousins. These are matches made in heaven for Gooden. There are no DeAndre Jordans or Blake Griffins on the Kings roster (those two nightmares await in L.A. Friday). The Kings are big and slow and like to throw their weight around, just like Drew. Pigs in slop? Something like that. This will be a rugged game in the paint. It’s not Gooden’s modus operandii, but he may want to help mind offensive opportunities for his fellow big men, Ersan Ilyasova and Jon Leuer. Ilyasova started with Gooden in Utah and shot just 1 for 8 in the Bucks’ 71-point offensive meltdown. Leuer shot 1 for 4. The Bucks need scoring from their big forwards, no doubt about that, with ill-shooting Brandon Jennings and Stephen Jackson manning most of the perimeter minutes. Ilyasova, in particular, is due for a good game, and he’ll start on ex-Cav Hickson, with whom he’s fairly well matched and acquainted. It should be a battle. But what I’m looking forward to the most is a Leuer vs. Cousins matchup off the bench. The Bucks will need Leuer to score, and Cousins is too slow-footed to guard the Bucks rookie. Cousins may be too big for Leuer, but Cousins is susceptible to offensive fouls, frustration, temper tantrums and other drama. The last time the Bucks were in Sacramento, Cousins committed four offensive charges against Ilyasova and Bogut, fouled out, threw a fit at the refs, and the Bucks prevailed with a strong 4th quarter. I can’t really think of any two young players who are such polar opposites as these two. Leuer, the cool, clever, good shooting, in control and fully developed 4-year college player vs. the raw, immature, undeveloped, out-of-control but talented Cousins. Leuer vs. Cousins: Book it, this should be fun to watch. Kings PF/C Jason Thompson is also a handful off the bench. Bucks shot-blocker Larry Sanders will get his minutes, and plenty of opportunity to wreak havoc above the rim. Larry is his name. TEAM TRAINER TEDIUM: Mike Dunleavy, Jr., is still out with a groin injury and not with the team. Luc Mbah a Moute is not expected to play due to soreness in his knee. Beno Udrih is day-to-day with the mashed shoulder he suffered in a collision with Andre Miller on Monday. Rookie Tobias Harris has not practiced. Darington Hobson has been recalled from the D-League and will probably play tonight. Aren’t Bucks injury reports boring? You bet. JOHN SALMONS: The Kings are all about their young guns, Marcus Thornton, Tyreke Evans and Jimmer Fredette, but the old fish is getting his minutes starting at small forward. Salmons’ defense is just as solid as ever and will likely guard Jackson, who, by transitive property of the 3-team trade, was the guy he was traded for. Jimmer and Beno, Tobias Harris and Shaun Livingston are the other pieces in this trade, which should make tonight’s game, in the very least, interesting. Salmons has started all seven games for the Kings and had a workmanlike game playing 30 minutes guarding Kobe Bryant and Ron Artest in a Kings win. Against the Knicks, he was the best King on the floor during a long stretch in the first half, though he had his hands full guarding Carmelo Anthony. And yes – Salmons is still shooting like crap (34%), though he’s hit a good percentage of his threes (38%), better than the 32% Jimmer’s shooting. Sure, I’ll be watching Salmons because he’s not Fredette or Stephen Jackson, but also because GM Hammond gave up on him far too soon. The revolving door that is the Bucks backcourt with Jennings is a sign that Hammond probably has ADD. But they’ve plunged to 28th in the NBA in team offense, scoring only 96.5 points per 100 possessions, causing fans throughout Bucksland to wonder whether this is what we get with Jennings at the point. There may be limits to how much the Bucks can improve from here. Even baby steps would be welcome, given the strength of the defense. With that in mind, most troubling is the Bucks defensive rebounding, which has fallen to 71%. They are not protecting their defensive backboard very well at all, despite a reputation as one of the better rebounding teams in the league. The Bucks rank 24th in controlling the defensive glass, which obviously undermines the great on-the-ball shot defense they’re playing. This gets more and more surprising with each game it continues. Not surprising is the jumper-chucking Bucks’ inability to the get to the line. They’re dead last in Free-Throws-Field-Goal percentage — only 16.4% of their shots have been free throws. Defensively, the Bucks are nearly opposite: They don’t allow teams to shoot well but they foul a lot. 26% of Bucks opponents’ shots have been free throws. Partial blame for this goes to Kevin Love and the T-Wolves loving referees. This entry was posted in The Jinx and tagged Brandon Jennings, DeMarcus Cousins, Drew Gooden, Ersan Ilyasova, Jimmer Fredette, John Hammond, John Salmons, Jon Leuer, Larry Sanders, Sacramento Kings on January 5, 2012 by J.D. Mo. The signings this week of Kyrylo Fesenko by the Warriors and Sam Dalembert by the Rockets has scratched two more centers off the free agent list, and that can only mean one thing for the Bucks: It’s ex-Buck Joel Przybilla or bust. But they may have to outbid the Clippers, who don’t have a backup behind DeAndre Jordan (or power forward Blake Griffin for that matter), and the Heat who are starting another guy named Joel (Anthony) who would look good backing up a healthy Przy. “Healthy Przy?” That’s not really realistic. He’s 31, had two knee surgeries and a long history of other injuries that have prevented him from playing full seasons in every year of his career but one. Take a look at Przy’s career stats – not a pretty sight. And, besides, acquiring Przybilla could well mean that the transformation of Drew Gooden into a bonafide, Kurt-Thomas-Omer-Asik, headband-wearing, Bogut-resting backup center might never happen in the Bucks universe. Strong games from a host of Bucks big forwards (Leuer and Ilyasova leading the way against Kevin Love) have created a logjam at the four, a nice problem to have but one that will only get worse when Luc Mbah a Moute’s right knee heals, or any day now. This has forced Gooden to the backup center spot to get playing time, with second year man Larry Sanders sitting next to him on the bench also vying for minutes. Between Gooden and Sanders, who still needs experience and playing time, they’ll have to get the job done. A broken down Przybilla just isn’t much of an improvement or anything to bank on, whether or not Bogut stays healthy. There’s also no reason to believe that the GM who, in the summer of 2010, made Sanders a first round draft pick and signed Gooden to a $6-million-a-year contract would admit defeat with either player, which is what signing Przy would amount to. The Gooden transformation, the Sanders development — they’re far more interesting than Przybilla’s last legs. 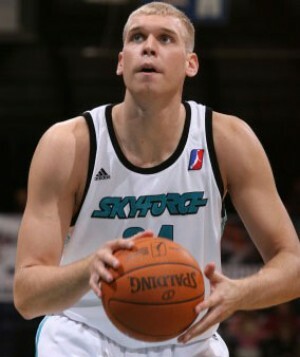 So is Greg Stiemsma, 4-year Badger, 2010 NBA Development League Defensive Player of the Year, now a Celtic. Tonight in New Orleans, Stiemsma has swatted four shots in the first half and, at last check, was helping Kevin Garnett pull the Celtics back into the game against the Hornets. This entry was posted in The Jinx and tagged Drew Gooden, Ersan Ilyasova, Greg Stiemsma, Joel Przybilla, John Hammond, Jon Leuer, Lary Sanders on December 28, 2011 by J.D. Mo. Tip off is in about ten minutes, and still haven’t seen Stephen Jackson in uniform. Andrew Bogut just got in the FoxNorth camera background and swished a warm-up free throw — right handed — and he’s not wearing a sleeve or a brace on the bad arm. The pregame hype revolves around Ricky Rubio‘s debut against Brandon Jennings, and Bogut’s health. Rubio isn’t starting – Luke Ridnour does. Interested to see who takes the Bucks first shot tonight. If this is anything like last year, it will be Drew Gooden, starting again at power forward, shooting at will. Not this year. Mike Dunleavy drains the Bucks first shot, a three-pointer off a feed from Bogut in the post. Dunleavy’s starting for Jackson. The starting lineup: Bogut, Gooden, Dunleavy, Delfino and Jennings. Gooden takes an off-balance post-up fallaway, misses. Bogut still hasn’t shot. 8-4 Bucks. The T-Wolves aren’t getting anything in the paint. 4 minutes in: Kevin Love beats Gooden on a drive and draws a foul. Skiles yanks Gooden and Ersan Ilyasova makes his entrance. 13-7 Bucks. Tobias Harris in for Delfino at the 6:30 mark. The rookie can get to the rim. First a layup on the break, then a foul drawn on a drive into the lane. Two free throws. 17-10 Bucks. Bucks need a good look and are trying to get it to Bogut in the post, can’t. 3 second call on Bogues on an Ilyasova drive. 17-15 Bucks. Rubio and J.J. Barea into the game. Barea somehow grabs an offensive board and Michael Beasley draws a foul on Tobias Harris. 17-16. Bucks don’t look settled at all on offense. Jennings, Beno Udrih, Harris, Ilyasova and now Brockman in for Bogut. We know the Brockman-as-backup-center didn’t work last year. Yet here we go again. 18-20 T-Wolves. Leuer into the game for Ilyasova, who has two fouls. Brockman-Leuer-Harris-Udrih-Shaun Livingston. This is a D-League lineup to close the first quarter with BJ Livingston and Beno. Udrih looks shorter in a Bucks uniform for some odd reason. 24-26 T-Wolves, end of quarter. What have we learned so far? Mike Dunleavy can shoot, and Delfino looks ready to have his best season as a pro. Bogut looks comfortable and healthy but didn’t get touches. The Gooden-Ilyasova playing time problem is still there, same as it was last season. The bench rotations aren’t set, and one wouldn’t expect them to be at this point. Livingston looks like Jennings’ taller, older brother. 2nd Quarter: Luc Mbah a Moute starts the quarter, immediately grabs an offensive board and lays it in, starting the Bucks on a 12-2 run. Leuer is scoring at will against Anthony Randolph. Moute is all over the court, making plays. The guy hasn’t practiced a day due to visa problems with Cameroon that finally cleared on yesterday. Bogut’s back in at about 9:00 left. He finally gets his first bucket after grabbing a Moute airball at the rim. Bogut at the line, 6:28 mark. He’s one for two, a lot of rim. Skiles calls timeout after the T-wolves bomb away from three to close the gap, then Gooden eats the ball in the post and takes another bad fallaway. 45-40 Bucks. Kevin Love just drained a three with Bogut in his face. Then another one. Skiles has realized he can’t put Gooden on him, so k-Love is Bogut’s charge. This is clearly a job for Ilyasova or Moute. 46-50 T-Wolves. Love hits another one from Downtown, where Bogut can’t get to him. Bogut looks annoyed, and answers with a driving lefty hook. Bucks go into timeout after a foul with Skiles looking confused. 48-55 T-wolves. 52-62 at half. Eight threes in the quarter by the T-Wolves. Ilyasova looks glum, but gives Gooden a hand slap on the way to the locker room. Bucks assistant Sidney Moncrief is clearly not happy. This looks far too much like the beginning of last season for comfort. Did the Bucks really just give up 62 to the T-Wolves in the half? T-Wolves are 8-11 from 3-point-land. SECOND HALF: Skiles starts Ilyasova on Love in the second half but Love picks up right where he left off and drains a mid-range jumper. He’s on fire. Now the refs are getting into it. Ticky-tacky fouls and the T-Wolves are living at the line. Great basketball play by Ilyasova – to Dunleavy – to Bogut for a dunk. Best passing of the night. 61-68 T-Wolves. Jennings hits a three from the corner. But the Bucks are having trouble with Mike Beasley. And Love again. 67-77. But Dunleavy’s keeping them close. Another three. 16 for Dunleavy. Love finally misses. A jumper by BJ, and the Bucks are in a groove with this unit: BJ, Delfino, Dunleavy, Ilyasova and Bogut. 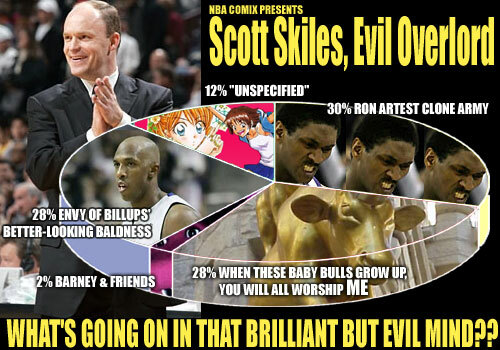 It’ll be interesting to see where Skiles goes from here. 79-72 with Bogut at the line. One of two – 79-73 and the Wolves turn it over. Skiles has stuck with the group for most of the quarter, then subbed Livingston for Delfino, which may signal a Skiles preference in terms of who’s on his bench. He’d normally go to Moute but Ersan has slowed down K-Love and Dunleavy’s filling it up. Bucks had a good rhythm going until a couple of fluke bounces led to second chance hoops for the T-Wolves. Bogut out after a ticky-tack call guarding Darko. These refs won’t let Bogut d-up on Darko? Really? 87-76 and it’s slipping back to the T-wolves. 92-78 at the end of 3 quarters. The T-Wolves cooled off a bit from Downtown (2-7) but got enough garbage going to hold the Bucks off. There’s not much to what the T-Wolves do but shoot threes and move off of point guard penetration. Which is to say that BJ and Dunleavy haven’t been good on the perimeter D. This is where the Bucks need Moute and Livingston to help tighten it up. (It’s not happening tonight). 4 th Quarter: The D-League unit of Udrih-Livingston-Hobson-Leuer-Brockman is getting smoked. 84-100 T-Wolves but Leuer has 14 against Derrick Williams this time in the matchup of rookies. Hobson has some nifty moves on the perimeter, dropped a nice pass to Livingston for a dunk. But how different from Chris Douglas-Roberts will he be? He’s bigger but CD-R was pretty smooth on the offensive end. I wonder how these things play out in GM John Hammond’s mind. Bucks are shanking shots, still with the D-League group. Ooof! Rubio to Derrick Williams for a lob dunk. Williams beat Leuer badly on a back-cut. 86-105. 86-107. Another dunk for Leuer. The rookies Rubio, Williams, Leuer and Hobson are putting on a show. Skiles isn’t entertained but, why not? This one’s over and it’s fun watching Leuer light it up in Bucks green. 117-96 final, a poor night on the defensive perimeter, a second quarter of bad matchups that Skiles would like to have back. LINK. Just to show that I didn’t make all this up. This entry was posted in The Jinx and tagged Andrew Bogut, Brandon Jennings, Drew Gooden, Ersan Ilyansova, Jon Leuer, Kevin Love, Luke Ridnour, Mike Dunleavy, Milwaukee Bucks, Minnesota Timberwolves, Ricky Rubio, Shaun Livingston on December 18, 2011 by J.D. Mo. The Celtics have taken point guard Keyon Dooling off the Bucks hands (yeah, calling Dooling a point guard is kind of a stretch at this point) clearing a roster spot for rookies Jon Leuer and Darington Hobson, who’s back in the Bucks camp after double hip surgery last season. How’d the Celtics, who are well over the salary cap and in luxury tax land, pick up Dooling without having to give up a $2 million player? They used a trade exception. Dooling was the Bucks biannual exception player, signed last year in GM John Hammond’s summer of disasters and will be paid $2.25 million this season. The Bucks this summer acquired point guards Beno Udrih and Shaun Livingston, making Dooling expendable. This entry was posted in The Jinx and tagged Boston Celtics, Danny Ainge, Darington Hobson, John Hammond, Jon Leuer, Keyon Dooling on December 10, 2011 by J.D. Mo. Forwards — wings and college big forwards more likely to play small forward in the NBA — are John Hammond’s modus operandi in the draft. He took three of them with his first six picks as Bucks GM, and now he’s drafted a fourth — Tobias Harris, who played a season at University of Tennessee. Oddly enough, though, there’s little talk of him at Bucks Draft Central, not even a mention from Bucks scouting director Billy McKinney. Harris worked out this past Tuesday (the 21st) with Marshon Brooks, Jon Leuer, Josh Selby (Kansas) and Chris Singleton (FSU). Only Singleton was off the board when the Bucks selected. At the workout, Marshon Brooks, the leading scorer in the Big East and the 25th pick by the Celtics (then traded to New Jersey for Jujuan Johnson of Purdue and a 2012 second round pick), received most of the attention, the thinking being at the time that the Bucks were looking for a shooting guard. Knicks fans in attendance at the draft were calling for Brooks as well, and, obviously the Celtics and the Nets were high enough on Brooks to draft him and then construct a trade over him. After acquiring three guards in the trade with the Kings and Bobcats today (Stephen Jackson, Beno Udrih and Shawn Livingston), the Bucks “shooting guard thinking” went out the window. But still, not a single mention of Tobias Harris on the Bucks draft and workout resource. I’m not sure what that means. At 18 years old, Harris was the youngest American college player in the draft. The Bobcats just took world-traveling big man Jeremy Tyler, making Jordan’s haul today Maggette, Bismack Biyombo, Kemba Walker and Tyler. Leuer was the pick. That’s a good choice for the Bucks – 6-11 big forward who can shoot, handle the ball, make plays and comes out of a defensive program. No, he’s not an NBA defensive player, not yet, but you got the feeling the Bucks were hoping he might fall to No. 40 after he worked out on Tuesday with Harris and Brooks. Here’s what Billy McKinney said about Leuer Tuesday. I like the thinking here with Leuer. The Bucks didn’t ovethink the 2nd round pick – they just scooped up a rangy, versatile big man who scored 18 a game and won in the Big Ten. Some are going to dog Leuer over his Big Ten tourney game against Purdue and his poor game against Butler, but … that was March Madness. Leuer’s game is too good to ignore, and picking him capped a very productive day in Bucks-land. This entry was posted in The Jinx and tagged 2011 NBA Draft, Beno Udrih, Billy McKinney, Jeremy Tyler, Jon Leuer, Marshon Brooks, Stephen Jackson, Tobias Harris on June 24, 2011 by J.D. Mo.